David Barr's blog about new homes for sale in Sarasota, Venice, and Lakewood Ranch. I specialize in helping home buyers locate and purchase new construction homes from the 40 new construction neighborhoods I serve in two of the top 5 master planned communities in the country. 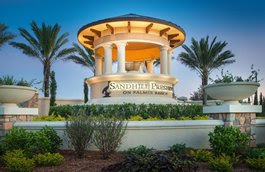 From August 7 to August 23, Divosta is offering some attractive incentives for new homes at Sandhill Preserve on Palmer Ranch. On the purchase of a new home, receive 25% off designer interior options, up to $5,000, on select homesites. Contact me for more information and to schedule a tour. 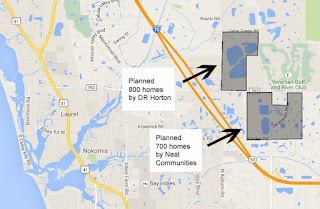 DR Horton and Neal Communities have begun work on two large new home communities east of I-75 off Laurel Road. Neal is building a 700-home community that will be called "The Villages of Milano". A couple of model homes and what looks to be a sales center seem to be near completion as of this writing. You can see this development on Jacaranda Rd, between Boundary and Laurel Rd. I've been told that DR Horton is developing a site for 800 homes, with ground being broken just west of the Willow Chase subdivision on the north side of Laurel Rd. It looks like DR Horton will be developing the former Stay N Play RV park and surrounding area. On top of that, Neal is also planning on a 250 home community further east on Jacaranda at Border Rd called The Woods of Venice. 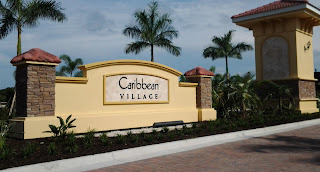 The model home at Caribbean Village is now open! If you would like more information on other Caribbean Village floor plans or area amenities, please contact me. Earlier this month ( January 2019), I issued an e-newsletter highlighting 6 new home communities in the Sarasota area. Add one more to the list. Promenade Estates is coming soon to the Palmer Ranch area. Located on Honore Avenue, south of Central Sarasota Parkway and directly across from Hammock Preserve, there's not much information available yet. Existing competing new home communities in Palmer Ranch offer paired villas, some town homes, and upscale single family homes, most of which I expect will be available in Promenade Estates. The builder, DR Horton, has a luxury home series called Emerald Homes, which I expect will occupy a section of the site, much like they are doing in Toscana Isles in nearby Nokomis/North Venice. I'll be updating my website page for Promenade Estates with the latest information as it becomes available. Bookmark my page or contact me for a tour of Sarasota new homes. Caribbean Village model homes are now open!